Hong Kong Maritime Rescue Coordination Centre (MRCC) is responsible to co-ordinate all maritime search and rescue (SAR) in international waters of South China Sea, bounded by Latitude 10° North and Longitude 120° East. This area is called the Hong Kong's maritime Search and Rescue Region (SRR). In response to a report of a suspected or actual distress situation of a vessel, Hong Kong MRCC will initiate a series of basic rescue control and co-ordination functions. Initially the officers will investigate and verify the reported distress to determine if a SAR response is needed. If the need is validated, efforts will be directed towards determining the type of assistance required taking into consideration such variables as the nature of the distress, assistance involved, and the availability of SAR resources. Once the need for a SAR response has been verified and the type of response selected, a SAR plan will be developed. 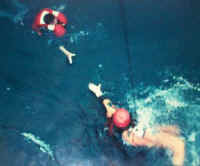 Officers will then co-ordinate to obtain SAR resources to execute the SAR plan. Officers will be fully engaged in tracking the progress of each resource responding to the mission, updating participants on any changes to the distress situation, co-ordinating support requirement and documenting all activity associated with the mission. When all rescue activity has terminated, a report on the mission will be prepared and sent to the Director of Marine.